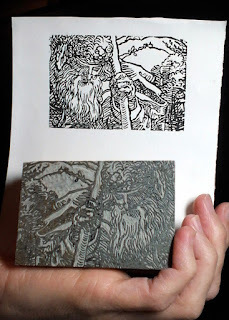 In October I sketched a detail of this Dürer woodcut to scale and carved it on linoleum with a woodcut knife to learn the process and see if I like it. The carving took longer than I expected, but was surprisingly enjoyable, more meditative than painting. So here is my first print ever. 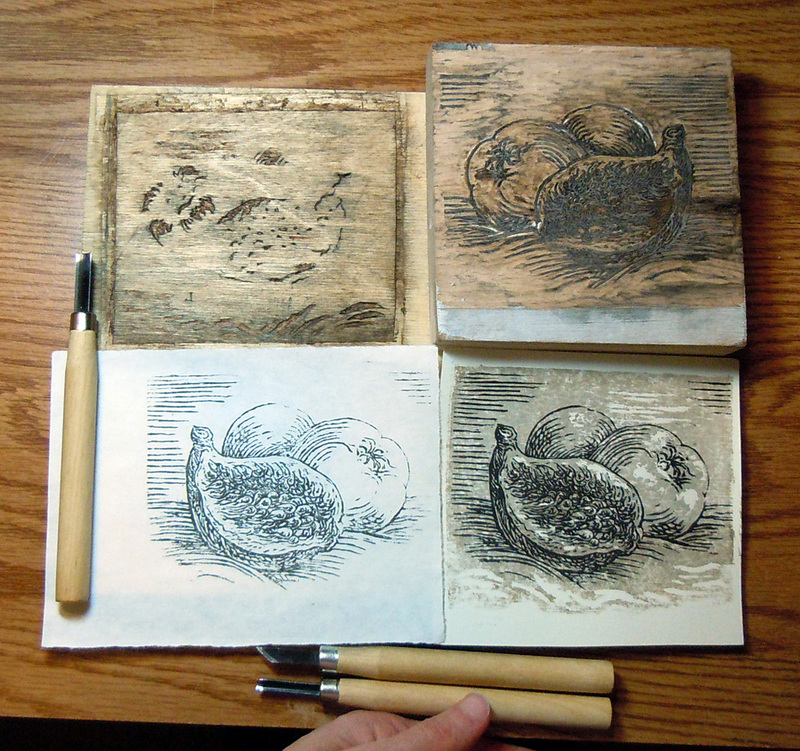 My second experiment was an attempt at a chiaroscuro woodcut. Wood is more fun, I noticed that the grain made me want to stylise and exaggerate while drawing (which gave the figs a sea-creature look). 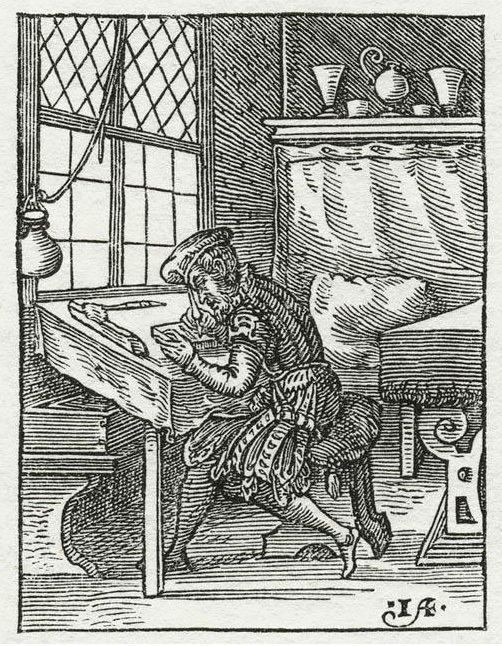 "The Renaissance Print" lists the tools: a pointed knife (to carve the outlines), and flat and round chisels (to remove remaining wood). This was deduced from the tool marks on surviving blocks. The wood types most frequently mentioned are pear and boxwood. The planks were usually covered with a white ground, the drawing was transferred or glued on (or drawn directly on the plank) and carved. This woodcut (1568) by Jost Amman shows a knife with a slanted cutting edge. The woodcutter's frilly trousers must be perfect for collecting wood shavings. In his 1766 treatise Papillon advises boxwood, service tree, wild and cultivated pear, apple and cherry. He suggests pear wood to beginners. He has an entertaining illustration of historic (2-15) and Asian (1) knives that he criticises as uncomfortable and dangerous. No.13 is described as the one most frequently seen in old monograms. These are illustrations of his own knife, how to shape it for various needs and how to handle it. It has a straight cutting edge with a bevel, and a slanted opposite edge (description here). Koehler shows more shapes redrawn from monograms. He says most depictions show a straight or a slightly curved cutting edge (the two knives at bottom right). 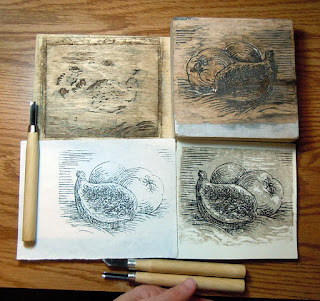 For comparison Japanese block prints are made mostly on sakura (wild cherry) wood. The drawng is pasted on and its outlines are carved with a knife with a slanted cutting edge and one bevel. 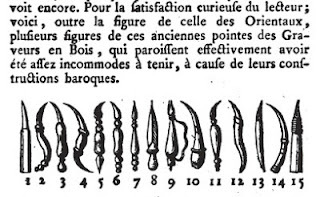 To sum up, it looks like most Renaissance knives had a slanted, curved or straight cutting edge. Most had a structure that allowed gripping them close to the tip, like a pen (like in Amman's and Papillon's illustrations of the process). Modern woodcut knives I've seen (Japanese and Western) need to be held differently because of their longer blades. So the most similar instrument I can think of is the regular pen-like X-acto knife, which I will try next time. 1) It seems (if I understood right) that Papillon carved with the knife bevel facing the print line, but what I read here for Japanese knives is that the bevel side compacts and damages the wood. Did Papillon not have that problem? Is it a problem for everyone? 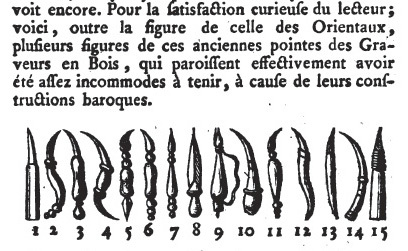 2) I'm curious if there is a more detailed description of a Renaissance woodcut knife and its bevels. 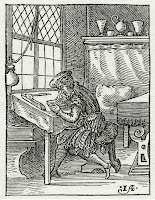 Parshall does say that the knife had one bevel and refers to a picture in "An Introduction to a History of Woodcut" by A. Hind. I got enthusiastic and found it, but it's only a modern drawing of a generic Japanese-looking tool. Hind says that the knife had one bevel, on the opposite side to that of a Japanese knife, but he doesn't say why he thinks so, so I feel like it could be a guess. no artwork or text by Lala Ragimov may be reproduced without permission of the author. Fascinating Lala. As someone who dabbles in print-making occasionally it is interesting to hear about the historical approaches to this medium.